Question: Is lunch be provided? Answer: No, lunch is not provided. However, there is a kitchen area in our area. 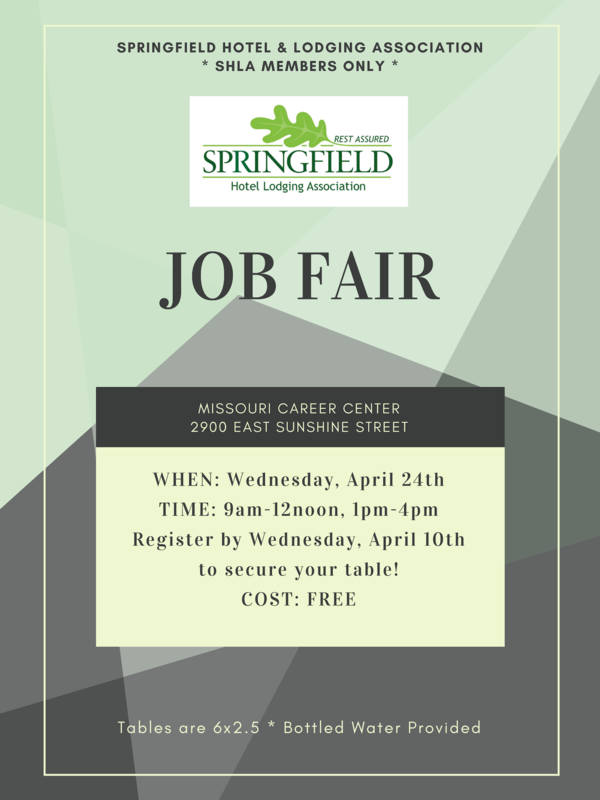 You may bring your lunch or there are a number of restaurants and eateries near the Missouri Career Center. In addition, bottled water is available in the kitchen area. Question: Will linen be provided to help dress our table? Answer: No, each SHLA Member Employer must bring their own linen and display materials. Question: How much does it cost to be a part of the fair? Answer: The SHLA Job Fair if FREE to current SHLA Lodging, Associate, and Allied Members. Question: Do I need to have a hard copy application available for applicants? Answer: This may be ideal depending on the flow applicants. However, there are two computers located in our area that can be used to apply online. Question: What if I miss the registration deadline? May I still participate? Answer: If there is still a table available. There is space available for only 20 tables. Registration is done on a first come, first serve basis and is the location of your table. Question: Do I need to be present at the fair or may I setup my table and leave? Answer: No, someone needs to available to greet applicants and provide information concerning your job openings.